With this method, the Slack message will be copied as a "quote" style within a ClickUp comment. We'll also include the link back to the Slack comment. - Optional: Choose a task from your Tray! 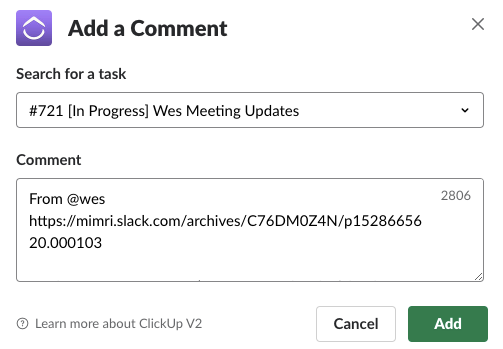 With this method, the Slack message will be copied to the ClickUp Task's description, along with a Slack link back to the comment. Follow the ClickUp Bot prompts to create your task! Send message directly to your Notepad for later reference! This creates a brand new note in your Notepad. Authorizing allows you to access all of the cool Slack features such as unfurling links and creating new tasks!